The Town of Comox, on Vancouver Island in British Columbia, has recently undergone a downtown revitalization project enhancing the historic flavour of the seaside community. At the heart of the community is the Fisherman's Wharf, which features a major marina with a public boardwalk perfect for viewing the boats that visit and work out of the Comox Harbour. Fresh seafood sales, right off the boat, add to the charm of this visitor friendly community. Comox is also home to great seaside shops and pubs, art galleries, two golf courses, the Filberg Heritage Lodge and Park and Canadian Forces base, 19 Wing Comox, and also hosts events including the Filberg Festival and Nautical Days. 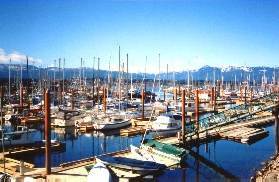 The community of Comox, BC and the Comox Valley is an outdoor enthusiast's dream come true. At sea level there are a variety of safe inviting beaches for swimming, salmon fishing and camping. Higher elevations bring the visitor easy access to a number of trail systems like the one at Strathcona Provincial Park. Hiking and camping possibilities are endless in these beautiful mountains and valleys. Strathcona is also a wildlife sanctuary with abundant deer and elk; their elusive predators, wolves and cougar are usually seldom seen. There are also a number of fresh water lakes in the Comox valley perfect for fishing or camping. Wildflowers abound to the naturalists' and photographers' delight. Mt. Washington is open year round; the summer months attracting the hikers or mountain bikers, while the winter snow beckons both the alpine and nordic skiier. Summer or winter the entire Comox Valley has something to offer any outdoor enthusiast. 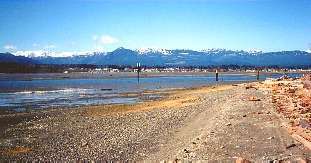 Access: Comox, BC, is 6 km (4 mi.) east of Courtenay, off Highway 19 on Vancouver Island. It is served by BC Ferries from Powell River (27 km/17 mi.). There is also access by commercial airlines and bus. Comox Valley Farmers Market begins, everything fresh and grown local, Comox Valley Fair Growns every Saturday 9 to noon. Accommodations: Visitors to Comox, BC, can enjoy a number of tourist services and lodging options in the Comox Valley and the neighbouring community of Courtney. They can choose accommodations at resorts, hotels, motels, lodges, RV sites or private or provincial campgrounds found in this beautiful area of central Vancouver Island. The Courtney - Comox area is a great base from which to enjoy area attractions, adventures and tours.